We created a self-service experience that empowers millions of New Yorkers to take control of their energy. Con Edison needed New Yorkers to be more engaged with their energy use. Create an inviting, customer-centric experience with self-service tools that drive people to manage their energy use independently. Easy to Use. Easy on the Eyes. Using bold, direct headlines and a friendly interface, we redesigned the customer experience to prioritize the tasks most important to customers. Paying bills is not how most people want to spend their time, so we made the experience as quick and painless as possible. 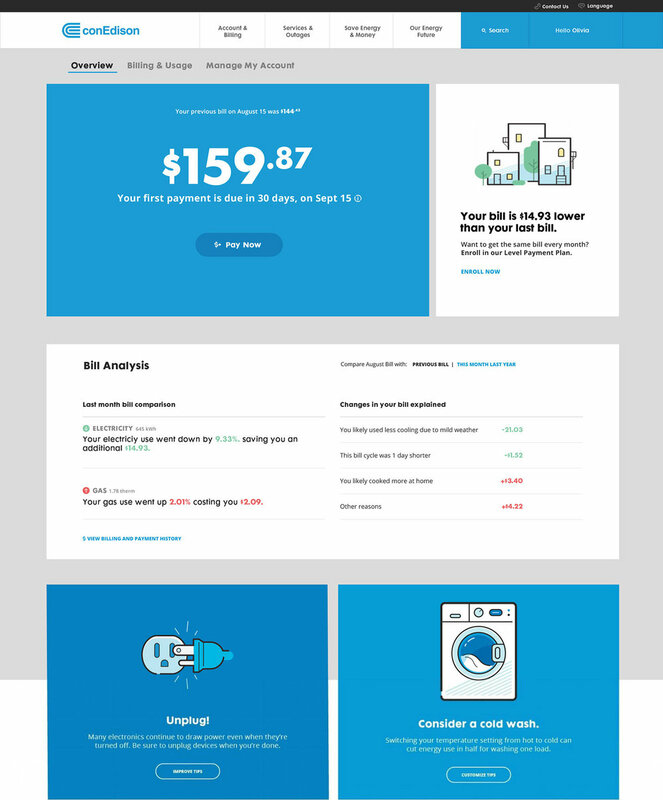 We put customers’ amount due front and center and provided a clear breakdown so they could see how much they owe and why. We improved site search and navigation, making it easier for customers to find valuable information about energy savings and innovation. Gone are the days of picking up the phone and waiting on hold to start your energy service. We created a simple, streamlined user flow that sets customers up in a few easy steps. 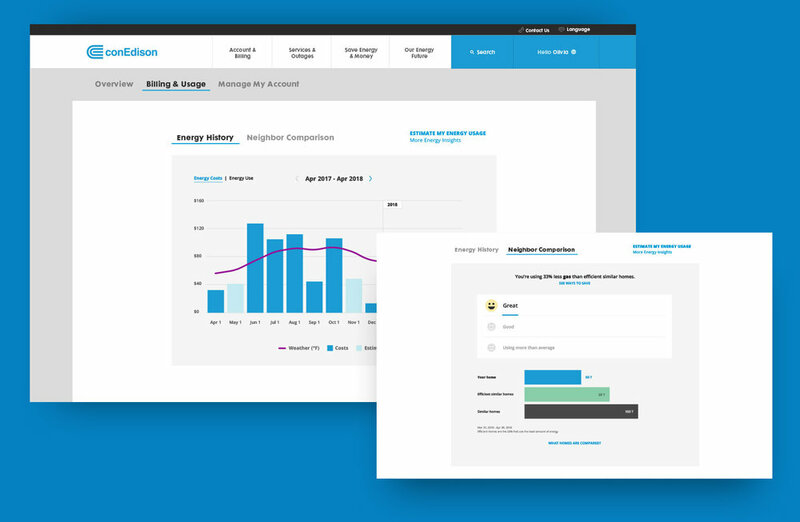 We made it easier to search and find information about energy savings and innovation, which is important when that content can teach customers how to save energy and money. 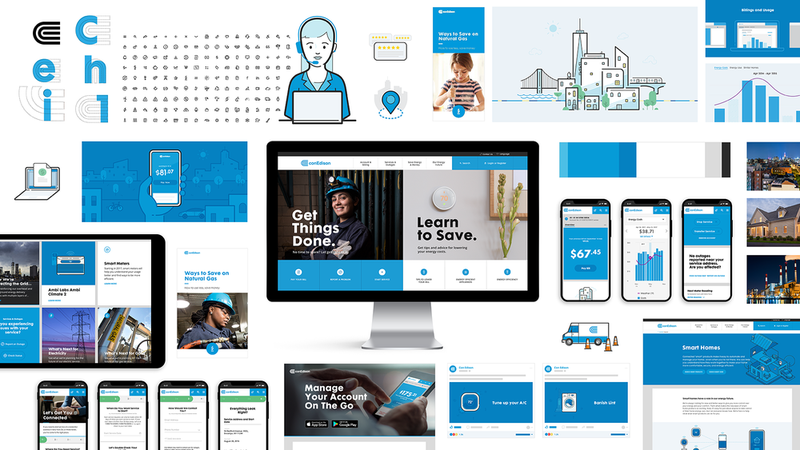 We evolved the Con Edison brand with a look, tone, and feel that was consistent across all touchpoints. Memorable visual cues created by our custom iconography, illustrations, and photography made the entire experience easy to navigate.